Replicating the European experience of the LNG Blue Corridor, this project promotes the introduction of LNG in road freight transport in the country and is making good progress. This is an initiative of ENAP and the distribution company MACO and included a testing phase, the obtaining of authorizations and, more recently, the corresponding approvals and certifications by the Ministry of Transportation for the use of this fuel in road freight transport. A truck of the Chinese brand FAW was chosen for the tests as it uses exclusively LNG for its operation. This brand is represented by MACO. The initiative is part of the “LNG as vehicle fuel” project, which ENAP’s Natural Gas Development Directorate of the Gas and Energy Management (G&E) has developed to introduce LNG as an alternative fuel for the automotive market mainly in road freight transport and public transport. As part of this initiative, ENAP and other industry players led the development of the technical regulation to formulate the Chilean norm that regulates the design, construction, and operations of LNG refueling stations. During 2017, the National Standards Institute (INN – Instituto Nacional de Normalización) approved for Chile the ISO-16923 and ISO-16924 standards that will allow the natural gas industry to sell LNG for the automotive market. As soon as MACO announced the availability in the country of the first truck that exclusively uses LNG, ENAP’s technical teams accepted the challenge of deploying joint efforts to achieve the homologation of this vehicle for its commercialization in Chile. Meanwhile, ENAP highlights the series of steps and tests involved until now. “Although this project included a long previous phase to carry out the load that would allow homologation, ENAP’s Gas Development area took on the challenge of carrying out this operation safely, convinced that a successful result could lead to a new business niche and the gateway to LNG as fuel for road freight trucks and urban and interprovincial passenger transport”, said Oscar Santibáñez, ENAP Gas Development Director. Both companies highlight what took place in September 2018, when the idea and concepts involved in the project were presented to the SEC, including the due safeguards and protocols established by international standards for this type of activities. Thus, after several months of preparation, the first LNG loading in a transport truck was successfully carried out in December 2018. Once the LNG loading was done, the FAW truck was presented to the Vehicle Control and Certification Center (3CV) under the Ministry of Transport, obtaining the homologation certificate, which enables this type of vehicles to be commercialized in the country. He thinks that this process marks the beginning of a path that, with innovative tools and in accordance with the authority, will allow the generation of opportunities in a new market niche for ENAP and for importers of freight and transportation vehicles. 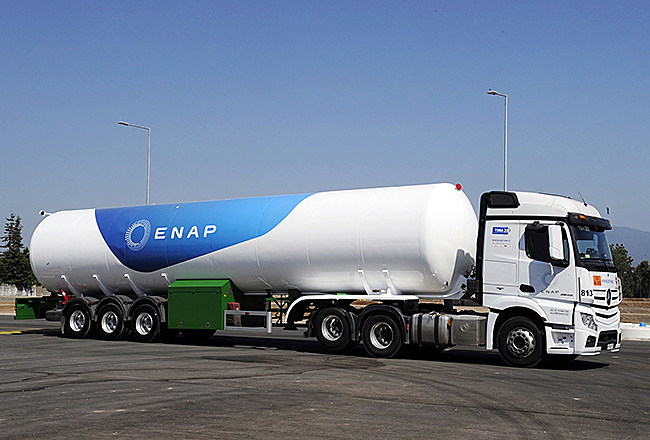 In fact, ENAP will soon explore a pilot project to incorporate LNG in a part of its fleet of trucks that transports its fuels through Chile. If this project is successful, the state-owned company will evaluate the complete conversion of its fleet to LNG and explore with market players opportunities to expand the use of this fuel in the automotive market.